The shareholders of Controls Direct Limited, the holding company of Roxspur Measurement and Controls Limited (RM&C) have completed the sale of their shares to global electronics company, TT Electronics. 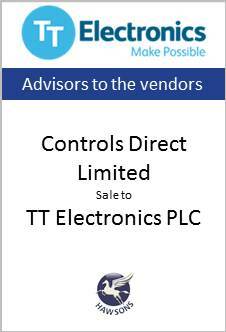 We were pleased to advise the shareholders of Controls Direct Limited on the sale of their shares to TT Electronics. TT Electronics, a global supplier of sensing and control solutions has completed the acquisition of Controls Direct Limited, the holding company of Roxspur Measurement and Control Ltd (RM&C). RM&C is a manufacturer of a range of temperature, pressure, flow and measurements products has a customer base of many blue chip companies. These include Rolls Royce, Tata and British Energy.